I was in Myrtle Beach on game night and could have sworn I was in Florida given how little they cared about the game. I went out to dinner, and the game wasn't on. Stopped at a cigar shop and it was after the game, ESPN was on with something, and the guy couldn't tell me for sure who had one. Stopped at a bar that had ESPN on, and asked 2 people working there, including a brother bouncer type, and he had no clue. Did you hear about the NIT T Shirt? CHARLESTON, W.Va. (AP) -Ouch! These T-shirts are hardly worthy of the NIT champions. The Mountaineers wore them anyway after their 78-73 victory over Clemson on Thursday night. WVU sports information director Shelly Poe said the NIT printed the shirts. Calls to tournament officials were not immediately returned Friday. West Virginia coach John Beilein also could not be reached for comment. 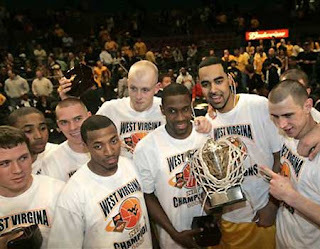 He and the team were on their way back to West Virginia after winning their first NIT title in 65 years. McRobert's Gone. Who is Next? I think I'll have a "Big Orange"
Has Anyone Seen These Men? The First Game is History... So is Clemson. Is Maryland the ACCs best chance?